Many companies in Atlanta have never considered having the roof cleaned; why is this necessary? There are a few reasons to consider professional cleaning of the roof, the most important element of your structure for protecting all that’s beneath it. If you’ve never considered having your commercial roof cleaned, here are a few reasons you should. Prevention of moisture build-up and rust. Depending on the type of roofing system you have, the build up of moisture and debris can be a serious problem. For instance, if you have a metal roof the build up of wet leaves can potentially trap moisture underneath, resulting in rust. When you have a metal roof it’s important to consider rust proofing because of these types of issues. Reflective roof systems become less energy efficient when dirty. 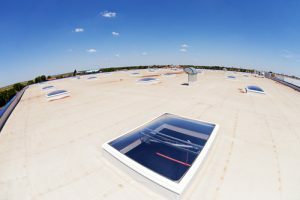 Certain types of roof systems including roof coatings, PVC, TPO and white EPDM offer energy efficiency because of their reflective properties. When the roof becomes dirty, having it cleaned will restore optimal energy efficient performance. Shingled roofing systems often become the victims of black algae, or Gloeocapsa magma. This is especially true in the southeast region of the U.S. Black algae will spread and holds moisture, which can ultimately destroy the material in the roof and even result in structural damage of your building. Shingles are often used on church roofs, business offices, apartments and other commercial buildings. Regardless of the type of roofing system you have on your commercial or industrial building, proper cleaning is recommended to prevent damage and extend the life of the roof. Doing this will save you money in the long run! From repair to maintenance and replacement, count on Kelco Roofing for all of your Atlanta commercial and industrial roof needs.